Finger Print time attendance is biometric application. It requires the user to enroll the fingerprint details of all the employees in a work place. Enrollment procedure consists of storing the unique and permanent fingerprint characteristics of each individual in the database as templates. After enrollment, the enrolled individual only needs to place the registered finger. His identity will be verified by the system and attendance will be marked on his behalf. A fingerprint scanner system has two basic jobs — it needs to get an image of your finger, and it needs to determine whether the pattern of ridges and valleys in this image matches the pattern of ridges and valleys in pre-scanned images. Only specific characteristics, which are unique to every fingerprint, are filtered and saved as an encrypted biometric key or mathematical representation. No image of a fingerprint is ever saved, only a series of numbers (a binary code), which is used for verification. The algorithm cannot be reconverted to an image, so no one can duplicate your fingerprints. Fingerprint method is the most widely used and popular form of biometric system used around the world. Over time in the last few years, there has been a huge improvement in technologies related to the hardware for Fingerprint readers, which has made the Fingerprint based biometric systems most accessible, efficient and affordable for small medium businesses. In fact, these days you get small/tiny fingerprint scanning devices for your own personal laptop too! Every individual’s Fingerprints are made of unique patterns and ridges formed in the skin surface of the fingers. A biometric fingerprint reader creates a high resolution image of these unique patterns of the person’s fingers. Once the reader has recorded these patterns, it will ensure accurate recognition of the same person based on his/her unique fingerprints. 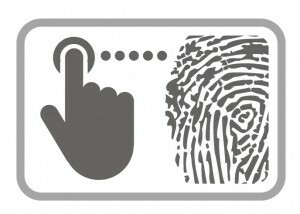 Though the actual fingerprint identification process may vary between different products or systems, the fundamentals remain the same.